Cord leaders led by Raila Odinga have told President Uhuru Kenyatta that respect is earned and he should respect the Opposition. The leaders were campaigning for their candidate in the Mathare by election a day after President Uhuru Kenyatta campaigned for the TNA candidate on Sunday. During his campaigns Kenyatta told Raila to respect him. “I respect my brother Uhuru and I also respected the court’s decision. If I did not respect him I would not have asked for dialogue. 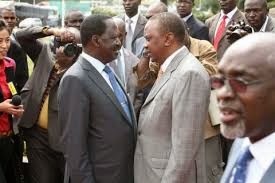 The President should stop demanding that I respect him, he should earn his respect,” Raila said. Wetangula told Jubilee that they miscalculated by misjudging the public mood. He said the fact that Cord was campaigning for a Kikuyu candidate is enough to show that the coalition was not tribal. “There is no looking back in our referendum call. We sought dialogue over the myriad of problems affecting the country including the high cost of living and the rising insecurity but they (Jubilee leadership) refused. I want to urge the people of Kenya to be ready because the referendum plane has already taken off,” said Odinga.